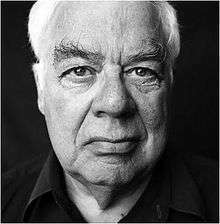 Richard McKay Rorty (October 4, 1931 – June 8, 2007) was an American philosopher. Educated at the University of Chicago and Yale University, he had strong interests and training in both the history of philosophy and contemporary analytic philosophy, the latter of which came to comprise the main focus of his work at Princeton University in the 1960s. He subsequently came to reject the tradition of philosophy according to which knowledge involves correct representation (a "mirror of nature") of a world whose existence remains wholly independent of that representation. Rorty had a long and diverse academic career, including positions as Stuart Professor of Philosophy at Princeton University, Kenan Professor of Humanities at the University of Virginia, and Professor of Comparative Literature at Stanford University. Among his most influential books are Philosophy and the Mirror of Nature (1979), Consequences of Pragmatism (1982), and Contingency, Irony, and Solidarity (1989). Rorty saw the idea of knowledge as a "mirror of nature" as pervasive throughout the history of western philosophy. Against this approach, Rorty advocated for a novel form of American pragmatism, sometimes called neopragmatism, in which scientific and philosophical methods form merely a set of contingent "vocabularies" which people abandon or adopt over time according to social conventions and usefulness. Abandoning representationalist accounts of knowledge and language, Rorty believed, would lead to a state of mind he referred to as "ironism," in which people become completely aware of the contingency of their placement in history and of their philosophical vocabulary. Rorty tied this brand of philosophy to the notion of "social hope"; he believed that without the representationalist accounts, and without metaphors between the mind and the world, human society would behave more peacefully. He also emphasized the reasons why the interpretation of culture as conversation (Bernstein 1971), constitutes the crucial concept of a "postphilosophical" culture determined to abandon representationalist accounts of traditional epistemology, incorporating American pragmatist naturalism that considers the natural sciences as an advance towards liberalism. "Nothing is sacred to Rorty the ironist. Asked at the end of his life about the 'holy', the strict atheist answered with words reminiscent of the young Hegel: 'My sense of the holy is bound up with the hope that some day my remote descendants will live in a global civilization in which love is pretty much the only law.'" Rorty enrolled at the University of Chicago shortly before turning 15, where he received a bachelor's and a master's degree in philosophy (studying under Richard McKeon), continuing at Yale University for a PhD in philosophy (1952–1956). He married another academic, Amélie Oksenberg Rorty (Harvard University professor), with whom he had a son, Jay, in 1954. After two years in the United States Army, he taught at Wellesley College for three years until 1961. Rorty divorced his wife and then married Stanford University bioethicist Mary Varney Rorty in 1972. They had two children, Kevin and Patricia. While Richard Rorty was a "strict atheist" (Habermas), Mary Varney Rorty was a practicing Mormon. Rorty was a professor of philosophy at Princeton University for 21 years. In 1981, he was a recipient of a MacArthur Fellowship, commonly known as the "Genius Award," in its first year of awarding, and in 1982 he became Kenan Professor of the Humanities at the University Of Virginia. In 1997 Rorty became professor of comparative literature (and philosophy, by courtesy), at Stanford University, where he spent the remainder of his academic career. During this period he was especially popular, and once quipped that he had been assigned to the position of "transitory professor of trendy studies." Rorty's doctoral dissertation, "The Concept of Potentiality" was an historical study of the concept, completed under the supervision of Paul Weiss, but his first book (as editor), The Linguistic Turn (1967), was firmly in the prevailing analytic mode, collecting classic essays on the linguistic turn in analytic philosophy. However, he gradually became acquainted with the American philosophical movement known as pragmatism, particularly the writings of John Dewey. The noteworthy work being done by analytic philosophers such as Willard Van Orman Quine and Wilfrid Sellars caused significant shifts in his thinking, which were reflected in his next book, Philosophy and the Mirror of Nature (1979). Views like this led Rorty to question many of philosophy's most basic assumptions—and have also led to him being apprehended as a postmodern/deconstructionist philosopher. Indeed, from the late 1980s through the 1990s, Rorty focused on the continental philosophical tradition, examining the works of Friederich Nietzsche, Martin Heidegger, Michel Foucault, Jean-François Lyotard and Jacques Derrida. His work from this period included Contingency, Irony, and Solidarity, Essays on Heidegger and Others: Philosophical Papers (1991) and Truth and Progress: Philosophical Papers (1998). The latter two works attempt to bridge the dichotomy between analytic and continental philosophy by claiming that the two traditions complement rather than oppose each other. According to Rorty, analytic philosophy may not have lived up to its pretensions and may not have solved the puzzles it thought it had. Yet such philosophy, in the process of finding reasons for putting those pretensions and puzzles aside, helped earn itself an important place in the history of ideas. By giving up on the quest for apodicticity and finality that Edmund Husserl shared with Rudolf Carnap and Bertrand Russell, and by finding new reasons for thinking that such quest will never succeed, analytic philosophy cleared a path that leads past scientism, just as the German idealists cleared a path that led around empiricism. In the last fifteen years of his life, Rorty continued to publish his writings, including four volumes of his archived philosophical papers, Achieving Our Country (1998), a political manifesto partly based on readings of Dewey and Walt Whitman in which he defended the idea of a progressive, pragmatic left against what he feels are defeatist, anti-liberal, anti-humanist positions espoused by the critical left and continental school. Rorty felt these anti-humanist positions were personified by figures like Nietzsche, Heidegger, and Foucault. Such theorists were also guilty of an "inverted Platonism" in which they attempted to craft overarching, metaphysical, "sublime" philosophies—which in fact contradicted their core claims to be ironist and contingent. Rorty's last works, after his move to Stanford University, focused on the place of religion in contemporary life, liberal communities, comparative literature and philosophy as "cultural politics." Shortly before his death, he wrote a piece called "The Fire of Life," (published in the November 2007 issue of Poetry magazine), in which he meditates on his diagnosis and the comfort of poetry. He concludes, "I now wish that I had spent somewhat more of my life with verse. This is not because I fear having missed out on truths that are incapable of statement in prose. There are no such truths; there is nothing about death that Swinburne and Landor knew but Epicurus and Heidegger failed to grasp. Rather, it is because I would have lived more fully if I had been able to rattle off more old chestnuts—just as I would have if I had made more close friends. Cultures with richer vocabularies are more fully human—farther removed from the beasts—than those with poorer ones; individual men and women are more fully human when their memories are amply stocked with verses." After rejecting foundationalism, Rorty argues that one of the few roles left for a philosopher is to act as an intellectual gadfly, attempting to induce a revolutionary break with previous practice, a role that Rorty was happy to take on himself. Rorty suggests that each generation tries to subject all disciplines to the model that the most successful discipline of the day employs. In Rorty's view, the success of modern science has led academics in philosophy and the humanities to mistakenly imitate scientific methods. Philosophy and the Mirror of Nature popularized and extended ideas of Wilfrid Sellars (the critique of the Myth of the given) and Willard Van Orman Quine (the critique of the analytic-synthetic distinction) and others who advocate the Wittgensteinian doctrine of "dissolving" rather than solving philosophical problems. In Contingency, Irony, and Solidarity (1989), Rorty abandons specifically analytic modes of explication in favor of narrative pastiche in order to develop an alternative conceptual vocabulary to that of the "Platonists" he rejects. This schema is based on the belief that there is no worthwhile theory of truth, aside from a boring, non-epistemic semantic one (as Donald Davidson developed out of the work of Alfred Tarski). Rorty suggests that the task of philosophy should be distinguished along public and private lines. Private philosophers, who provide one with greater abilities to (re)create oneself, a view adapted from Nietzsche and which Rorty also identifies with the novels of Marcel Proust and Vladimir Nabokov, should not be expected to help with public problems. For a public philosophy, one might turn to Rawls or Habermas. In this text, Rorty focuses primarily on the continental philosophers Heidegger and Derrida. He argues that these European "post-Nietzscheans" share much with American pragmatists, in that they critique metaphysics and reject the correspondence theory of truth. When discussing Derrida, Rorty claims that Derrida is most useful when viewed as a funny writer who attempted to circumvent the Western philosophical tradition, rather than the inventor of a philosophical (or literary) "method." In this vein, Rorty criticizes Derrida's followers like Paul de Man for taking deconstructive literary theory too seriously. In Achieving Our Country: Leftist Thought in Twentieth-Century America (1997), Rorty differentiates between what he sees as the two sides of the Left, a cultural Left and a progressive Left. He criticizes the cultural Left, which is exemplified by post-structuralists such as Foucault and postmodernists such as Lyotard, for offering critiques of society, but no alternatives (or alternatives that are so vague and general as to be abdications). Although these intellectuals make insightful claims about the ills of society, Rorty suggests that they provide no alternatives and even occasionally deny the possibility of progress. On the other hand, the progressive Left, exemplified for Rorty by the pragmatist Dewey, Whitman and James Baldwin, makes hope for a better future its priority. Without hope, Rorty argues, change is spiritually inconceivable and the cultural Left has begun to breed cynicism. Rorty sees the progressive Left as acting in the philosophical spirit of pragmatism. Rorty is among the most widely discussed and controversial contemporary philosophers, and his works have provoked thoughtful responses from many well-respected philosophers. In Robert Brandom's anthology, entitled Rorty and His Critics, for example, Rorty's philosophy is discussed by Donald Davidson, Jürgen Habermas, Hilary Putnam, John McDowell, Jacques Bouveresse, and Daniel Dennett, among others. In 2007, Roger Scruton wrote, "Rorty was paramount among those thinkers who advance their own opinion as immune to criticism, by pretending that it is not truth but consensus that counts, while defining the consensus in terms of people like themselves." John McDowell is strongly influenced by Rorty, particularly by Rorty's Philosophy and the Mirror of Nature (1979). In continental philosophy, authors such as Jürgen Habermas, Gianni Vattimo, Jacques Derrida, Albrecht Wellmer, Hans Joas, Chantal Mouffe, Simon Critchley, Esa Saarinen and Mike Sandbothe are influenced in different ways by Rorty's thinking. American novelist David Foster Wallace titled a short story in his collection Oblivion: Stories "Philosophy and the Mirror of Nature," and critics have accredited Rorty's influence to some of Wallace's writings on Irony. Susan Haack has been a fierce critic of Rorty's neopragmatism. Haack criticises Rorty's claim to be a pragmatist at all and wrote a short play called We Pragmatists, where Rorty and Charles Sanders Peirce have a fictional conversation using only accurate quotes from their own writing. For Haack, the only link between Rorty's neopragmatism and the pragmatism of Peirce is the name. Haack believes Rorty's neopragmatism is both anti-philosophical and anti-intellectual, and exposes people further to rhetorical manipulation. Rorty often draws on a broad range of other philosophers to support his views, and his interpretation of their works has been contested. Since Rorty is working from a tradition of re-interpretation, he remains uninterested in 'accurately' portraying other thinkers, but rather in utilizing their work in the same way a literary critic might use a novel. His essay "The Historiography of Philosophy: Four Genres" is a thorough description of how he treats the greats in the history of philosophy. In Contingency, irony, and solidarity, Rorty attempts to disarm those who criticize his writings by arguing that their philosophical criticisms are made using axioms that are explicitly rejected within Rorty's own philosophy. For instance, Rorty defines allegations of irrationality as affirmations of vernacular "otherness", and so—Rorty claims—accusations of irrationality can be expected during any argument and must simply be brushed aside. Mind, Language, and Metaphilosophy: Early Philosophical Papers Eds. S. Leach and J. Tartaglia. Cambridge: Cambridge University Press, 2014. ISBN 978-1-107-61229-7. ↑ "Richard Rorty: The Making of an American Philosopher". press.uchicago.edu. 1931-10-04. Retrieved 2012-09-26. ↑ Bernstein, Adam (11 June 2007). "Richard Rorty, 75; Leading U.S. Pragmatist Philosopher". washingtonpost.com. Retrieved 26 September 2012. 1 2 3 Bruce Kuklick. "Neil Gross, Richard Rorty: The Making of an American Philosopher." Transactions of the Charles S. Peirce Society 47.1 (2011):36. 1 2 "Jürgen Habermas: Philosopher, poet and friend (12/06/2007)". signandsight. Retrieved 2012-09-26. ↑ Marchetti, Giancarlo. "Interview with Richard Rorty." Philosophy Now Volume 43, Oct.-Nov. 2003. ↑ Ryerson, James. "Essay: Thinking Cheerfully." The New York Times Book Review. July 22, 2007: p 27. ↑ Rorty, Richard (November 2007). "The Fire of Life". Poetry magazine. ↑ "Richard Rorty," (short obituary), June 9, 2007. ↑ Scruton, Roger (2007-06-12). "Richard Rorty's legacy". openDemocracy. Retrieved 2012-09-26. ↑ In the preface to Mind and World (pp. ix–x) McDowell states that "it will be obvious that Rorty's work is [...] central for the way I define my stance here". ↑ Howard, Jennifer. "The Afterlife of David Foster Wallace". Chronicle of Higher Education. Retrieved 30 December 2013. ↑ Susan Haack (November 1997). "Vulgar Rortyism". New Criterion. ↑ Haack, Susan (1993). "Ch. 9: Vulgar Pragmatism: an Unedifying Prospect". Evidence and Inquiry. Oxford UK: Blackwell. ISBN 0-631-11851-9. ↑ "The failure to recognize science's particular powers to depict reality, Daniel Dennett wrote, shows 'flatfooted ignorance of the proven methods of scientific truth-seeking and their power.'" Arriaga M / Richard Rorty's anti-foundationalism and traditional philosophy's claim of social relevance. Rorty interview, "Against Bosses, Against Oligarchies," conducted by Derek Nystrom & Kent Puckett, Prickly Paradigm Press, Sept. 1998. Rereading Rorty by Albrecht Wellmer in Krisis, 2008.